Lively familiar disco tunes and legendary songs of generation of the 1970s-1980s are expected to revive audiences’ youth memories. 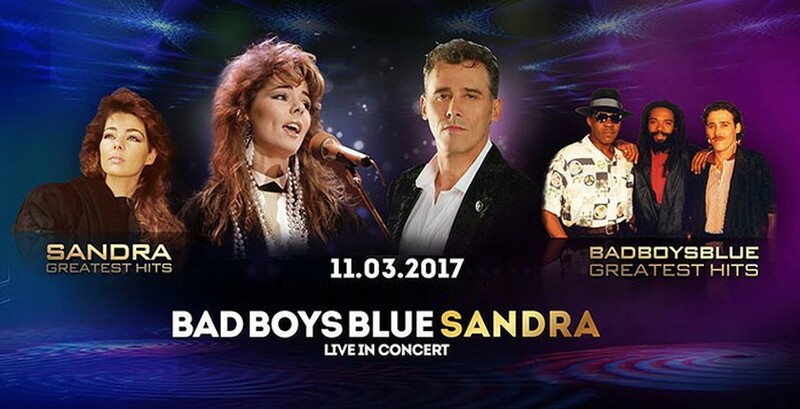 The Bad Boys Blue was formed in 1984 by German producer Tony Hendrik and his lyricist wife Karin van Haaren. The multinational pop group is well-known for their international hits including "You're a Woman", "Pretty Young Girl", "I Wanna Hear Your Heartbeat", and "Come Back and Stay". The band was released the single “You’re A Woman”, which became a massive hit in Europe in 1985; the anniversary single titled “Come Back and Stay Re-Recorded 2010″ and the anniversary album titled “25″ including 25 Re-Recorded hits, 7 brand new remixes plus bonus DVD in 2010. Andra Ann Lauer, commonly known under her stage name Sandra, is a German pop singer who enjoyed a mainstream popularity in the 1980s and early 1990s with a string of European hit singles, “(I’ll Never Be) Maria Magdalena” , “In the Heat of the Night”, “Everlasting Love”, “Secret Land”, “Hiroshima”, and “Don’t Be Aggressive”. Her albums “Into a Secret Land” in 1988 and “Close to Seven” in 1992 received very high critical acclaim. Prior to embarking on a solo career, Sandra was the lead singer of an all-female disco trio Arabesque, which had a massive following in Japan and USSR. Also, between 1990 and 2001, she provided vocals on album releases of the very successful musical project Enigma, which had top 10 hits in North America and United Kingdom. Sandra remains one of the most popular singers of the 1980s in Continental Europe. With sales in excess of 30 million records worldwide, Sandra has established her position as the most successful German disco/pop female vocalist.